"If the farming focus is not on the health of the soil as foundation (ie. biodynamic or organic farming) then it's about destructive attempts at manipulating nature for profit ("intellectual property"). This at the expense of our environment as a whole. " For 3 generations now, we have invested in sustainability. Our main focus has always been our soils. We have been planting cover crops, green manures, and no-till farming since the 1960's. We have always practiced Integrated Pest Management (IPM) because it's simply more cost-effective and good stewardship. The perception is that these are practices used only in organic agriculture. To us, they are simply the way we operate our farm. Always have, always will. 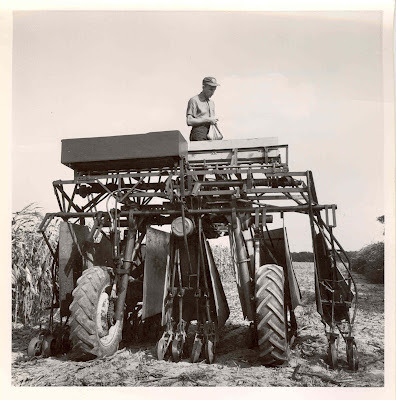 My father-in-law on an over the row, no-till Hiboy, 1964. High tech for its day. Today, we continue to invest heavily in equipment and technology to help us not only be more efficient but also to continue to improve our soils, use less resources, lower our CO2 emissions, and improve our water quality. Sustainability does not meet a cookie-cutter, one-size fits all model, or apply to only one type of farming system or practice. Soil types, climate, topography, equipment, resources, access to capital and amount of debt carried by a family farm are all factors that contribute to its sustainability. So today, we were top-dressing winter wheat using our GreenSeeker technology and it ties in nicely with my comments about sustainability on our farm. 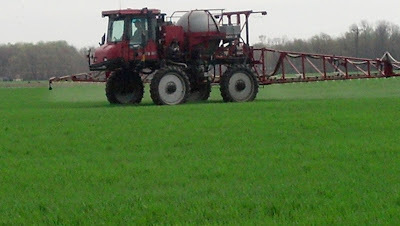 My husband, Hans driving the sprayer outfitted with GreenSeeker technology. He is applying fertilizer which is called "top-dressing" the winter wheat crop. How do we know it requires fertilizer? 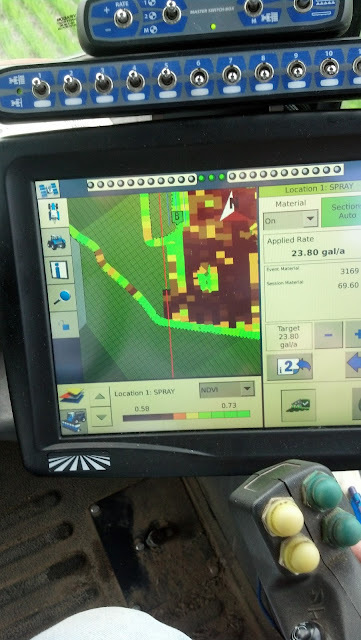 This amazing piece of technology called the "GreenSeeker" tells us! 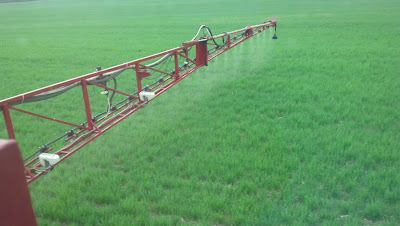 On the spray booms are optical sensors that detect the level of chlorophyll in the plants. Chlorophyll is the molecule that absorbs sunlight and synthesizes carbohydrates for energy for plant growth. We know this as photosynthesis, a process all plants are dependent upon for health. 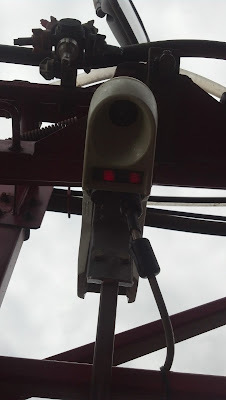 This monitor inside the cab shows the driver the Normalized Difference Vegetative Index "NDVI". The color variation of chlorophyll is detected by the optical sensors and reflected on the monitor by a color range from brown to green. Green means there is more chlorophyll, yellow is in the middle, and brown is the least amount. 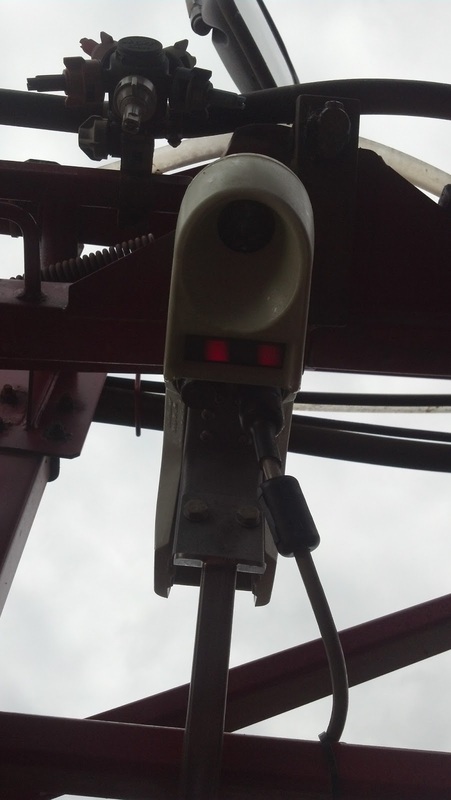 The GreenSeeker applies a variable rate of fertilizer specific to the area that the optical sensor detected. So you can see here, the spray boom with the optical sensors and the variation in the rate of the nozzles applying fertilizer heavier in some areas and less in others. 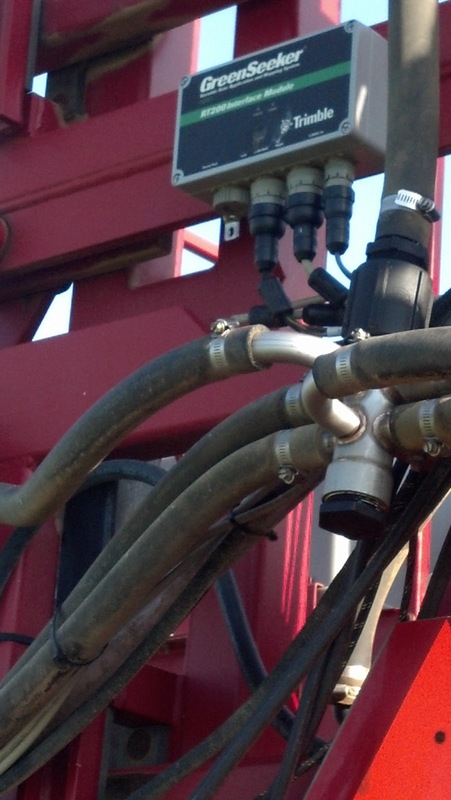 Not all nozzles run at the same rate and will turn off all together if no fertilizer is needed. By practicing precision agriculture, we have both an environmental and an economic impact. The variable rate fertilizer application allows us to apply only what the plant needs based on its chlorophyll content. In some areas, that meant a savings of over 15 pounds of nitrogen per acre. The plant utilizes this application more efficiently resulting in less fertilizer remaining in the soil which ultimately can improve water quality. GreenSeeker is just one piece of equipment that our family farm invested in to add more tools to our toolbox of sustainable farming practices. We have heavily invested in conservation equipment and practices on our farm as our philosophy is to treat our soil for what it is, our livelihood and the future for our children. We have taken the best of all farming system practices and combined them with some of the latest modern technology to create a sustainable family farm that we are proud to call home. As we go through the growing season this year, I hope to highlight some of the other approaches we use to be environmentally, economically, and socially sustainable on our modern family farm.